For carrying out section 301 and title IV of the PHS Act with respect to drug abuse, [$1,025,435,000] $1,023,268,000. The total change for the FY 2015 President’s Budget for NIDA, which is $7.514 million more than the FY 2014 Enacted level, for a total of $1,023.628 million results in no major changes. The impact of substance abuse in this country is daunting: the economic toll alone is estimated to exceed $600 billion a year in health care, crime-related, and productivity losses1. NIDA strives to invest in genetics, neuroscience, pharmacotherapy, and behavioral and health services research to develop new strategies for preventing and treating substance abuse and addiction. There is a fundamental need to enhance our understanding of the multiple processes that contribute to human behavior and how their disruption can lead to addiction. A more detailed and personalized account of them will lead to more effective and precise interventions to prevent and treat this complex brain disorder. In this context, and largely thanks to recent technological developments, we have made important advances along the axis linking genes with behavior. As a result, we now have an unprecedented capacity to screen for thousands of genetic variations and catalogue how they modulate abuse/addiction risk by influencing brain maturation, its neural architecture, and behavioral patterns. For example, NIDA supported researchers undertook a large genome-wide association study in which more than 8,000 research participants were genotyped on more than 500,000 single nucleotide polymorphism (SNP) markers. The first results of this effort identified 13 SNPs as potential candidates for variants associated with the brain’s ability to inhibit prepotent or inappropriate behaviors, a key marker of addiction vulnerability2. However, it is now clear that the mere identification of vulnerability genes is only the beginning. By using such genome and, increasingly, whole individual sequence analysis to zero in on the genes that modulate risk, addiction researchers are also advancing their understanding of how environmental factors (e.g., parental style, drug exposure) can affect the expression of those genes to either strengthen or weaken behavioral patterns through epigenetic changes that do not change their sequence. A good example is the recent finding that exposure of adolescent rodents to nicotine causes epigenetic changes on the Fos B gene, which in turn sensitize brain circuits to the behavioral effects of cocaine administration3. The systematic identification of genetic, environmental, and neurocircuitry variations that modulate abuse/addiction risk is bound to revolutionize our prevention and treatment capacities. Yet, despite the recent stunning progress in the neurosciences, many of the biggest questions about the human brain remain unexplored, largely due to a lack in ability to explore how individual cells and complex neural circuits interact in both time and space. This is why NIDA is excited to partner with other NIH Institutes in support of the President’s Brain Research through Advancing Innovative Neurotechnologies (BRAIN) Initiative that is focused on building a new arsenal of tools and technologies for helping scientists unlock the mysteries of the brain Working in partnership with other NIH institutes along with the Defense Advanced Research Projects Agency and the National Science Foundation, discoveries and innovations that come out of this Initiative will help the economy create jobs, make high technology solutions available to more people, and attract more young people to science. All of these efforts are poised to usher in a new era in which neuroscience and technological advances will increasingly transform prevention interventions. Ongoing investigations to strengthen circuits (e.g., self-control), whose suboptimal functioning increase substance use risk 4,5, or to design health promoting messages better attuned to the unique neurobehavioral profile of young people6 are perfect examples of this true paradigm shift. Big data sets are essential platforms for the analysis of complex systems in genetics and epigenetics, proteomics, brain imaging and clinical science. For example, vast amounts of data are being produced by the overlaying of structural and functional brain imaging information that links the molecular and cellular data with the expression of higher-level brain function. A prime example is the new fMRI-based approach to generating images of the functional connectivity (FC) among brain regions in the absence of any specific task, the so called resting state (rs) FC. This technique offers a powerful window into circuit-level functions that may generate behavioral responses underlying vulnerability or a diseased state. Open access to such massive databases could lead to the identification of biomarkers of psychiatric illness risk, trajectory, and treatment response that will propel the field toward an unprecedented level of predictiveness and precision. Similarly, in collaboration with the NIH Pain Consortium, NIDA is helping support the development of a free, open source, centralized national pain registry for tracking chronic pain sufferers and their self-reported outcomes over time. Combined with concerted efforts in the pharmacogenomics of prescription opiates, pain registries are poised to help us maximize the effectiveness of pain treatments while minimizing the likelihood of prescription opiate abuse and addiction. However, the analysis, interpretation, and quality control of big data sets present formidable challenges that will require the establishment of new infrastructure, training paradigms, interdisciplinary teams, and a culture change that reflects the importance of open access to data. NIDA currently supports a great deal of innovative research on drug addiction and related health problems such as pain and HIV/AIDS and will continue to be at the forefront of training the next generation of innovative researchers. The 6-year old Avant-Garde award is a good example of a program that stimulates high–impact research that could lead to groundbreaking opportunities for the prevention and treatment of HIV/AIDS in drug abusers. NIDA is now crafting a new kind of award, which would blend NIH’s Pioneer and New Innovator award mechanisms. This new opportunity, called “AVENIR” awards, is designed to attract creative young investigators into HIV/drug abuse public health research. Another example in this area are NIDA’s Cutting-Edge Basic Research Awards (CEBRA), designed to foster highly innovative or conceptually creative research that advances our understanding of drug abuse and addiction. The latest results of this effort include three independent studies exploring the potential benefits of neurofeedback training, transcranial magnetic stimulation, and meditation for facilitating smoking cessation. The latter study, showing that meditation improves the function of brain areas related to self-regulation, is of particular interest because it highlights the connection between seeking and rewarding creativity and the creation of opportunities to examine remediation of mental disorders in a completely new light. The field of addiction research continues to benefit from the explosion in genetic knowledge, the advent of precise technologies to probe neuronal circuits, and the emergence of openly accessible big data platforms. NIDA’s research is strategically poised to take full advantage of these and other emerging opportunities to develop the knowledge base that can be used in the real world to reduce drug use in this country. Overall Budget Policy: The FY 2015 President’s Budget request for NIDA is $1,023.268 million, an increase of $7.514 million or 0.7 percent above the FY 2014 Enacted level. Research priorities include those that position the Institute to advance the development of medications, taking advantage of innovative genetics tools and technologies, and translating the results of evidence-based findings to improve drug abuse interventions and promote greater access to them worldwide. HIV prevention and treatment is another top NIDA research priority, including research on the interactions between HIV, substance abuse, and other comorbid psychiatric disorders, linking vulnerable populations to HIV prevention, testing, and treatment services, addressing HIV/AIDS-related health disparities, and integrating the treatment of substance abuse and HIV. Funds are included in competing RPGs to support the trans-NIH BRAIN Initiative. Epidemiology, Services, and Prevention Research: This NIDA Division supports integrated approaches to understand and address the interactions between individuals and environments that contribute to drug abuse-related problems. It supports large surveys (e.g., the annual Monitoring the Future Survey, which tracks drug use and related attitudes among teens) and surveillance networks (e.g., the Community Epidemiology Work Group) to monitor drug-related issues and trends locally and nationally. Program efforts help identify substance abuse trends locally, nationally, and internationally; guide development of responsive interventions for a variety of populations; and encourage optimal service delivery in real-world settings. For example, factors associated with marijuana use have been undergoing dramatic changes. The potency, sources, availability, public perception, and legal status are significantly different than when marijuana use became a national issue more than 40 years ago. NIDA plans to support research to better understand the longer-term outcomes resulting from these changes, such as trends in use, harm perception, clinical/social consequences, brain development, educational outcomes, and market/demographic variables, particularly for adolescents and young adults. Such knowledge can be then used to inform policy, the public, and to improve prevention and treatment interventions. Budget Policy: The FY 2015 President’s Budget estimate for this program is $253.817 million, an increase of $1.800 million or 0.7 percent over the FY 2014 Enacted level. Basic and Clinical Neuroscience: The Basic and Clinical Neuroscience programs work together to expand understanding of the neurobiological, genetic/epigenetic, and behavioral factors that underlie drug abuse and addiction. Specifically, they examine which variables influence risk of drug abuse, addiction, and drug-related disorders; how addiction works in the brain, including the effects of drugs on the expression or silencing of genes; and how resultant changes affect brain function and consequent behaviors. Collectively, this research provides critical information to develop and test novel prevention and treatment interventions for drug abuse and addiction. For example, as mentioned above, a pressing research priority that has recently emerged due to the rapidly changing political and legal landscape surrounding marijuana, is the need to improve our understanding of the role of the endocannabinoid system in brain development, function and activity and the impact of marijuana use on these processes (particularly among young people). These programs also support fundamental research to better understand brain function. For example, our knowledge of the various mechanisms the brain uses to fuel its operations (i.e., brain energetics) is surprisingly limited. Energy utilization patterns in the brain enable and shape all mental and behavioral activities, both normal and pathological. Brain energy utilization (and thus behavior) is profoundly affected by environmental conditions, such as diet, stress and exposure to drugs of abuse. NIDA is, therefore, soliciting grant applications to improve our basic understanding of the molecular mechanisms whereby chronic exposure to drugs of abuse impacts brain energetics. Successful projects are poised to identify new molecular targets that could be harnessed to design novel medications and/or behavioral treatments for addiction. Budget Policy: The FY 2015 President’s Budget request for this program is $440.720 million, an increase of $2.599 million or 0.6 percent over the FY 2014 Enacted level. Pain management is an important component of high-quality compassionate medical care. Opioid analgesics are among the most effective and thus popular classes of drugs indicated for pain treatment. Unfortunately, the benefits of long-term opioid analgesic treatment are accompanied by significant risk of developing drug tolerance (and the need for escalating doses) and hyperalgesia (increased pain sensitivity). In addition, for persons with risk factors for addiction, exposure to potentially rewarding substances, like opioid analgesics, may reinforce drug-taking behavior. These are intrinsic liabilities of opiate analgesics that clearly increase the risk for diversion, abuse, addiction and overdose. NIDA recognizes it has a critical role in ensuring the availability of safe and efficacious chronic pain management options while minimizing risk of abuse. This is why we are committed to supporting research designed to better predict who is at risk of addiction and to develop new classes of effective, nonaddicting pain medications. A good example of researchers’ attempts to identify predictors and markers of pain is the recent study in which MRI scans were used to “visualize” the telltale signs of physical pain in the brain and, for the first time, measure its intensity and tell whether a drug was relieving it (Wager at al, 2013). Although preliminary, these results are exciting because having a reliable signature (biomarker) for pain opens the door to a host of research and treatment opportunities, like an increased ability to define who needs opioid and how much. One of the promising objects of study towards the development of non-opioid pain analgesics is a chemical called resiniferatoxin (RTX), which selectively kills overactive pain fibers in the spinal cord. NIDA helped to obtain clearance from the Food and Drug Administration (FDA) to begin clinical studies of RTX. Initial trials at the National Institutes of Health (NIH) Clinical Center have shown remarkable efficacy in the reduction of severe cancer pain. Parallel to the efforts designed to develop pain medications with reduced abuse and addiction liability are the efforts that strive to minimize the risk of overdose with existing medications. It is worth highlighting a partnership established between NIDA and Lightlake Therapeutics Inc., to develop an intranasal delivery system of naloxone (an opioid receptor blocker that can rapidly reverse the overdose of prescription and illicit opioids) , which could greatly expand its availability and use in preventing opioid-related deaths, a public health problem of epidemic proportion in the U.S. Finally, NIDA is also pursuing non-pharmacological approaches to tackling this epidemic. Recognizing that when abused, even a single large dose can cause severe respiratory depression (and death), NIDA has launched a new SBIR initiative to develop mobile devices for the rapid identification of respiratory distress in the wearer to facilitate the rapid delivery of overdose reversal medications. Pharmacotherapies and Medical Consequences: This program area is responsible for medications development aimed at helping people recover from drug abuse and addiction and sustain abstinence. For example, to leverage NIDA resources this program is encouraging the formation of strategic alliances between collaborating organizations (such as academic institutions, pharmaceutical and biotechnology companies) with the common goal of advancing medications through the development pipeline toward Food and Drug Administration (FDA) approval in a timely manner. This Program also includes research to address the medical consequences of drug abuse and addiction, including infectious diseases such as Hepatitis C virus (HCV) and HIV. Because of the high co-occurrence of substance abuse and infectious diseases, infectious disease specialists have a role to play in ensuring that their HIV+/HCV+ patients receive treatment for their substance-use disorders. NIDA plans to support research to address this critical gap by understanding both the barriers to and opportunities for engaging infectious disease specialists in implementing screening, brief intervention, and referral to treatment in their practices. Budget Policy: The FY 2015 President’s Budget request for this program is $133.025 million, an increase of $1.128 million or 0.9 percent over the FY 2014 Enacted level. Next-generation pharmaceuticals will surely take advantage of new technologies. Chief among these are our current approaches to develop viable immunotherapeutic or biologic (e.g., bioengineered enzymes) approaches for treating addiction. The goal of this active area of research is the development of safe and effective vaccines or antibodies that target specific drugs, like nicotine, cocaine, and heroin, or drug combinations. If successful, immunotherapies--alone or in combination with other medications, behavioral treatments, or enzymatic approaches—stand to revolutionize how we treat, and maybe even someday prevent addiction. Unlike conventional small molecule therapies, which target the neural pathways/receptors involved in drug addiction, immunotherapy targets the drug itself. The concept of addiction immunotherapies is exciting because the approach would stimulate the body to generate antibodies that bind specific drugs while they are still in the bloodstream, blocking their entry into the brain. The resulting reduction of reinforcing effects is expected to aid relapse prevention. The most advanced of these efforts relate to the development of a viable nicotine vaccine, which have established the necessary proof of principle (Hartmann-Boyce, et al. 2012). The more recent disappointing results of a Phase III clinical trial, however, suggests that further research and optimization is needed to bring the promise of this approach to clinical fruition. Current efforts hinge on overcoming the relatively low antigenicity of these vaccines, identified as a key technical hurdle. To overcome this obstacle, a recent NIDA-supported preclinical study used an adeno-associated virus (AAV) to deliver a gene encoding a high-affinity anti-cocaine monoclonal antibody into mice. The introduction of this gene stimulated the animals to produce high levels of cocaine-specific antibodies, which prevented cocaine from entering the brain and rendered them impervious to cocaine's behavioral effects for at least four months after the injection (Rosenberg, et al. 2012). An alternative approach involves the use of a highly efficient anti-drug enzyme to neutralize the drug while still in the bloodstream, keeping it from entering the brain. Recently, one group of researchers used the same adenovirus carrier system mentioned above to deliver a gene that encodes for an enhanced version of a naturally occurring cocaine-metabolizing enzyme called butyrylcholinesterase. Preliminary results in rodents showed that a single injection of a virus carrying this gene completely blocked cocaine's effects in the body and central nervous system for at least six months (Geng, et al 2013). NIDA has now established a strategic research partnership with Teva Pharmaceutical Industries to test the feasibility of delivering a bioengineered version of this enhanced and highly specific enzyme in humans. Combined, these results suggest that using an adenovirus "shuttle" to deliver an efficient anti-cocaine antibody or cocaine metabolizing enzyme is a feasible approach and could be used to treat cocaine addiction. If successful, this strategy could also be applied to other drugs of abuse (e.g., methamphetamine, heroin) where the feasibility of producing high-affinity monoclonal antibodies has already been demonstrated. This type of approach would have other benefits in that it would obviate the need for patient adherence with frequent medication regimens or even multiple vaccine injections. Clinical Trials Network: NIDA's National Drug Abuse Treatment Clinical Trials Network (CTN) comprises 13 research nodes and more than 240 individual community treatment programs in 38 States, plus the District of Columbia and Puerto Rico. The CTN develops and tests the feasibility and effectiveness of promising medications and behavioral treatment approaches for drug abuse and related disorders, such as comorbid mental health disorders and HIV, with diverse patient populations and community treatment providers. The CTN is currently at the final stage of completing (1) a multi-site study to evaluate the effect of Screening, Brief Intervention, and Referral to Treatment (SBIRT) in emergency departments on substance use and substance-related outcomes, (2) a trial of the safety and effectiveness of Suboxone (buprenorphine) plus Vivitrol (extended-release naltrexone) for the treatment of cocaine addiction in patients also abusing opioids, and (3) a randomized trial evaluating safety and preliminary efficacy of buspirone for relapse-prevention in patients with cocaine addiction. Ongoing studies are evaluating (1) the effect of contingency management on treatment engagement of HIV-infected drug users, (2) comparison of Vivitrol to Suboxone for patients addicted to heroin or other opioids, including prescription pain relievers, (3) N-acetylcysteine for treatment of marijuana addiction, (4) combination therapy with Vivitrol plus Wellbutrin (bupropion) for treatment of methamphetamine addiction, and (5) Vivitrol for HIV positive opioid users in HIV settings. Budget Policy: The FY 2015 President’s Budget request for this program is $45.508 million, an increase of $0.500 million or 1.1 percent over the FY 2014 Enacted level. Intramural Research Program (IRP): The Intramural program performs cutting edge research within a coordinated multidisciplinary framework. The IRP attempts to (1) elucidate the nature of the addictive process; (2) determine the potential use of emerging new therapies for substance abuse, both pharmacological and psychosocial; and (3) establish the long-term consequences of drugs of abuse on systems and organs, with particular emphasis on the brain and its development, maturation, function, and structure. A prime example of the unique role the IRP plays in furthering substance abuse research is the recently established Designer Drug Research Unit (DDRU), created in response to the worldwide epidemic of synthetic drug abuse. Synthetic drugs are marketed as safe, cheap and legal alternatives to illicit drugs like marijuana, cocaine and ecstasy. However, they can produce serious cardiovascular and neurological side effects that require emergency medical care and can be fatal. Many popular designer drugs have been rendered illegal by regulatory control, but new replacement analogs are flooding the marketplace at an alarming rate. The NIDA IRP is uniquely poised to respond to this public health crisis by collecting, analyzing and disseminating current information about the pharmacology and toxicology of newly emerging designer drugs. The IRP also works collaboratively with NIDA’s Extramural Division of Pharmacotherapies and Medical Consequences of Drug Abuse to identify potential targets for addiction medications, an approach that should speed up the progress of selected targets along the NIDA medications development pipeline. In addition, NIDA and NIAAA together have made significant progress at integrating their intramural research programs in substance use, abuse, and addiction, including the appointment of a single Clinical Director for NIAAA and NIDA and the establishment of a joint genetics Intramural Research Program and a common optogenetics lab. Budget Policy: The FY 2015 President’s Budget request for this program is $88.180 million, an increase of $0.873 million or 1.0 percent over the FY 2014 Enacted level. Research Management and Support (RMS): RMS activities provide administrative, budgetary, logistical, and scientific support in the review, award, and monitoring of research grants, training awards, and research and development contracts. Additionally, the functions of RMS encompass strategic planning, coordination, and evaluation of NIDA's programs, regulatory compliance, international coordination, and liaison with other Federal agencies, Congress, and the public. NIDA currently oversees more than 1,800 research grants and more than 190 research and development contracts. In addition to the infrastructure required to support research and training, NIDA also strives to educate the public about drug abuse and addiction and to raise awareness of the science addressing it. Adolescents are a key target for NIDA’s outreach efforts. NIDA created National Drug Facts Week (NDFW), a weeklong health observance event held annually at the end of January during which teens and scientists connect at local events to discuss the scientific facts about drug abuse and addiction. In 2013, more than 500 events were held reaching all 50 states. Promotional media activities surrounding the week reached more than 71 million people. Another key audience is health care professionals. In October 2012, the Office of National Drug Control Policy (ONDCP) and NIDA launched two online continuing medical education courses—one focused on safe prescribing for pain, the other on managing patients who abuse prescription opioids—in partnership with Medscape. To date, these courses have been completed more than 60,000 times for credit, and more than 100,000 times not-for-credit. In 2014, NIDA will also publish a new NIDA Principles of Effective Treatment for Adolescents, intended to provide parents, referring clinicians, treatment practitioners, youth, and others with an evidence-based resource to the principles of effective substance abuse treatment for youth. 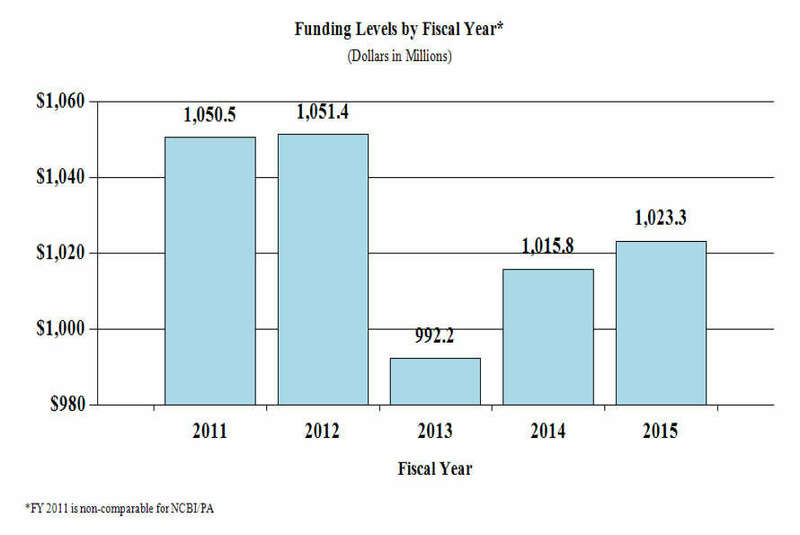 Budget Policy: The FY 2015 President’s Budget request for this mechanism is $62.018 million, an increase of $0.614 million or 1.0 percent over the FY 2014 Enacted level. NIH Collaborative Activities: NIDA actively participates in a variety of trans-NIH activities. Common Fund - NIDA has a lead role for the Common Fund–supported Epigenomics Program and additionally will be administering a request for application (RFA) to support a data management center for the new Common Fund Extracellular RNA Communication Program. NIH Pain Consortium - NIDA is the lead on the NIH Pain Consortium Centers of Excellence in Pain Education (CoEPEs) to enhance patient outcomes by improving the education of health care professionals about pain and its treatment and the Pathways to Prevention Workshop (PPW) that will comprehensively review the literature on the effectiveness of opioids for the treatment of chronic pain. 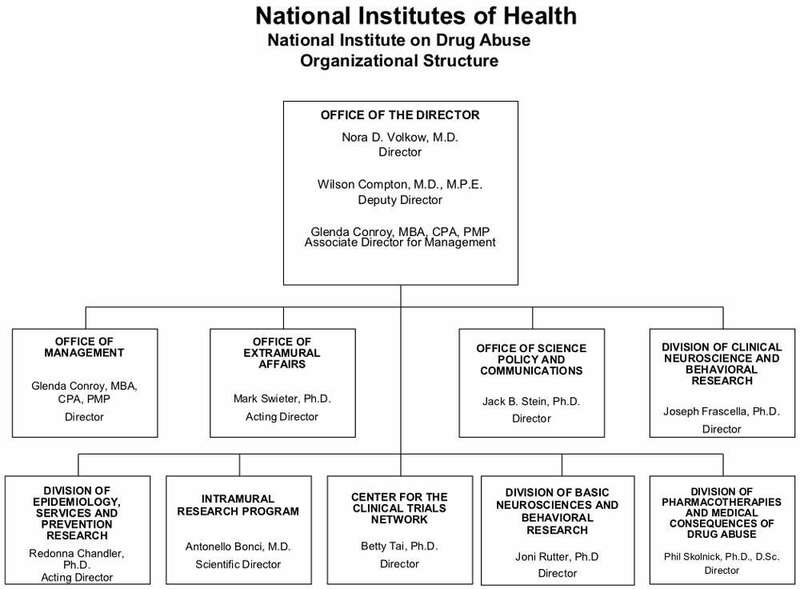 Collaborative Research on Addictions at NIH (CRAN) - NIDA, NIAAA, and the Tobacco Control Branch within NCI together lead the CRAN, which was established in 2013 to inject synergism and efficiency in the addiction field. To date, CRAN has released two funding announcements to promote collaborative research on addiction, and will be launching a new webpage to provide researchers and other stakeholders with funding information, news, and events as they emerge. NIDA is also integrally involved in the BRAIN (Basic Research through Advancing Innovative Neurotechnologies) Initiative – a trans-agency effort that includes NIH, the National Science Foundation, and Defense Advanced Research Projects Agency (DARPA). This initiative will build on recent successes in neuroscience to create and apply new tools for producing dynamic pictures of the brain that show how individual brain cells and complex neural circuits interact at the speed of thought. This new understanding will allow scientists to explore how the brain records, processes, uses, stores, and retrieves vast quantities of information, and shed light on the complex links between brain function and behavior. The information gleaned from this initiative will provide an unprecedented view of the complex neural changes that occur in addiction leading to new approaches for treating and preventing this devastating disease. 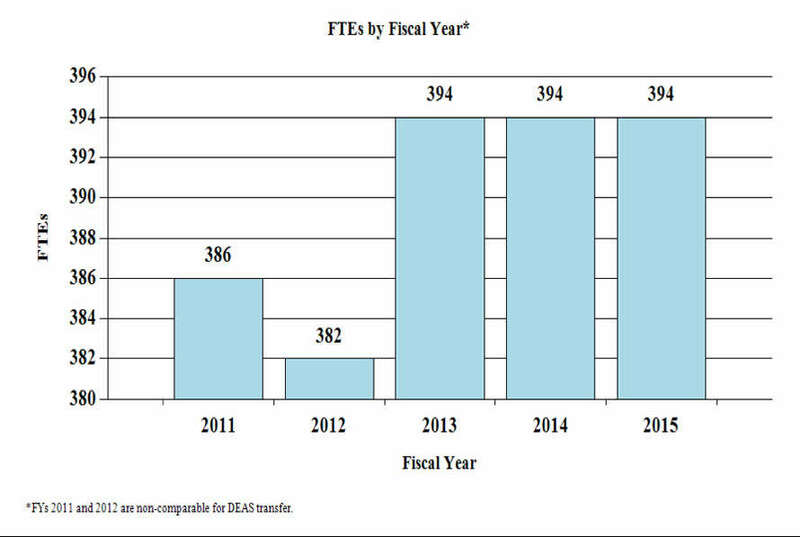 In FY 2014, NIH will invest a total of $40 million to launch its part of the BRAIN Initiative. To ensure the Initiative’s success, NIH is requesting a total of $100 million in FY 2015 to advance the high priority research areas of the BRAIN Initiative, as outlined in its interim strategic plan. 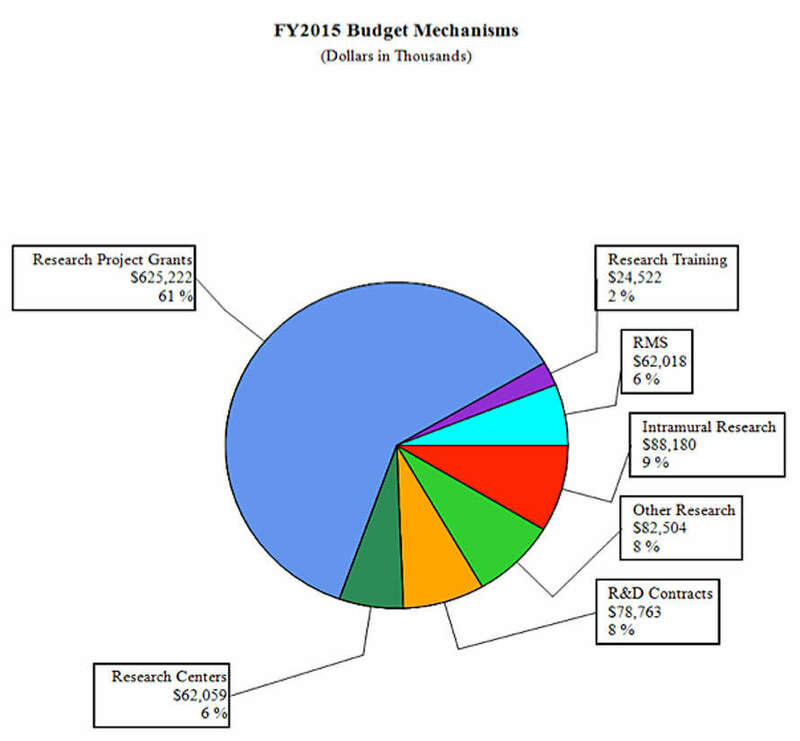 As one of the leaders of the BRAIN Initiative at NIH, NIDA is requesting an increase of $7 million in its budget to support these research priorities. NIH Blueprint – In addition to the BRAIN Initiative, NIDA is the lead for the NIH Blueprint–supported Institutional Training Grants on Computational Neuroscience and Neuroimaging, and the Neuroscience Information Framework (a dynamic inventory of Web-based neuroscience resources, data, and tools for scientists and students). 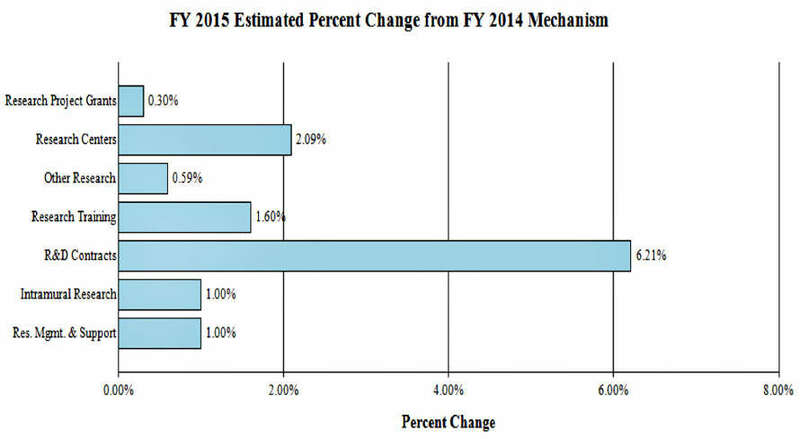 Download the full 2015 Fiscal Year Budget (PDF, 1MB). National Drug Intelligence Center (2010). National Threat Assessment: The Economic Impact of Illicit Drug Use on American Society. Washington, DC: United States Department of Justice.